I arrive in Indore with the goal of leaving this teeming commercial city in western Madhya Pradesh quickly and heading southwest. Intrigued by its past as the capital of a princely state, I seek out two of its most prominent landmarks, both vestiges of the Holkar dynasty, which ruled this region for over two centuries. I’m surprised by the stark difference between the two royal palaces. In the center of the old town is Rajwada, the royal family’s former home, built in 1766. The seven-story palace suffered a series of fires that gutted its interiors, but it has been beautifully restored, with the carved wooden window frames and porches of its overhanging balconies its most magnificent details. In contrast, the sprawling Lalbagh Palace is more recent, modeled after European palaces of the 18th and 19th centuries. I could very well be in a royal house of Europe: the front gates are replicas of those of Buckingham Palace, and inside I find columns of Italian marble, gilded chandeliers, sculpted ceilings and an opulent rococo-style ballroom like the ones I’ve seen in Vienna and Versailles. Leaving dusty Indore far behind, the road to Mandu winds steadily upwards; and once through the stone gateway marking the threshold to this citadel town, I enter another time and place. Among its fortified walls are the surprising remains of a 23km2 mini-kingdom dotted with man-made lakes and the ruins of grandiose Islamic-style buildings. My guidebook tells me that most of Mandu’s majestic palaces, pavilions, mosques, and tombs were built by its sultan rulers between 1401 and 1529 when it was called Shadiabad, the ‘city of joy’. I also read that some of the finest examples of Afghan architecture in India are found here. I rent a bicycle to better explore this sprawling but a tranquil outdoor museum of atmospheric ruins. On my map, I locate Jahaz Mahal, meaning ‘ship palace’. This majestic palace of arched doorways and domed pavilions is said to look like a vast ship straddling two lakes when it’s completely surrounded by water during the monsoon. I find only large scattered puddles – the monsoon is long over – where a few women are busy doing laundry. I wander around the shell of this roofless palace, taking in its many astonishing details, like the delicate blue-and-yellow tile work and spiral-shaped water channels carved in the pink stone leading to the numerous bathing pools, once used by the sultan’s harem. The Sri Omkar Mandhata temple is the island’s most prominent temple and every pilgrim’s first stop. I head towards the Jama Masjid next and take in the magnificence of its grandiose red-stone structure long before I finally reach it. Built in 1454, this is the largest example of Afghan architecture in India and was modeled on the great mosque of Damascus. It’s topped by three large domes, with a series of smaller cupolas crowning its long pillared colonnades. I climb up the steps of its domed porch and admire the delicate stone latticework of its arched windows. Cycling south of the village, I pass Talab Lake and reach Mandu’s furthermost cluster of monuments perched on the edge of a cliff: the imposing palace of Baz Bahadur, the last sultan of Malwa, and Rupmati’s Pavilion, which he built for his beloved. I read that the sultan had fled when his kingdom came under attack, abandoning Rupmati, who poisoned herself to avoid capture. I arrive at one of the two rooftop pavilions just in time to catch the sunset views stretching over the plains below where Rupmati had surely caught sight of the advancing troops. On the pilgrimage trail in Omkareshwar The next day I leave the lush landscapes of Mandu behind and arrive in Omkareshwar, a bustling pilgrimage town on an island in the middle of the holy Narmada River. Crossing the footbridge to the island, I take in the buzzy vibe and what looks like the spiritual version of a fun fair. The smell of camphor and incense burns my nostrils as I pass rows of makeshift stalls peddling vegetarian food, religious paraphernalia, CDs of devotional music and mobile phone accessories. The steps of the bathing ghats descending to the river are crowded with pilgrims bobbing up and down in the water, while holy men sit obliviously deep in meditation on platforms overlooking the river. The scene is set to a mixed melody of soothing chanting pierced by the cacophony of temple loudspeakers blasting music. 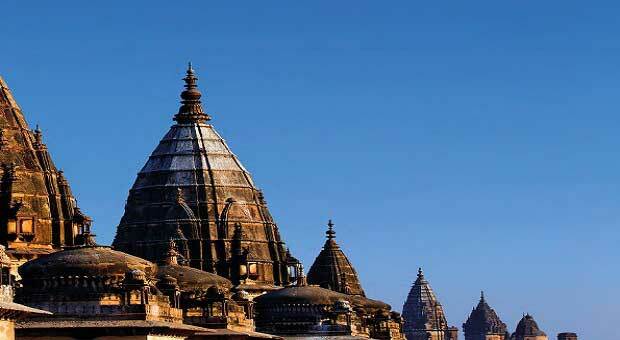 The Sri Omkar Mandhata temple is the island’s most prominent temple and every pilgrim’s first stop. This is one of India’s 12 temples with a sacred jyotirlingam – a natural phallic-shaped rock where the god Shiva manifested himself as a column of light. I watch worshippers offering flowers and pouring milk on to the lingam. With this ritual complete, they can embark on the pilgrimage route that follows the Narmada River. 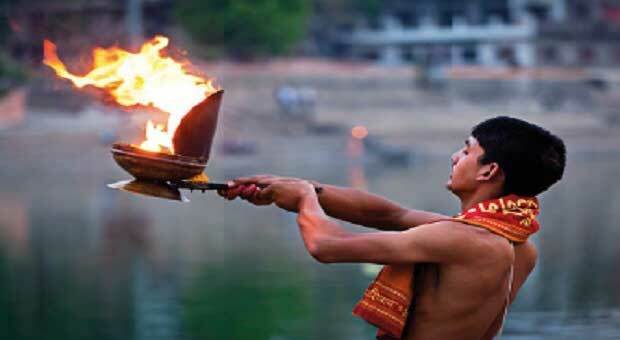 A Brahmin performing the puja ceremony on the bank of the River Kshipra. Moving in the same direction along the circumambulatory path that runs clockwise around the island are pilgrims of all ages. Some are entirely dressed in white and walk in small groups, but there are also crowds of adolescents who look like they’re on a school trip. I pass shrines and temples, gangs of monkeys, and stalls selling coconuts, flowers and oil lamps. My steps are rhythmed by the sing-song of chanting that’s only interrupted when pilgrims greet each other with a cheerful Hari Om! I board one of the motorboats ferrying passengers to the confluence of the Narmada and Kaveri rivers, the holy Sangam, where the two rivers gush violently into each other. The waters quickly become unnavigable and we disembark while the boatmen jump into the water and push the boat through the strong current and around the tip of the island. I watch as my co-passengers take a quick dip in the divine waters, the women fully clothed, before climbing back aboard the rickety boat. It’s sunset when I arrive in Maheshwar, 65km west along the Narmada. I’m awed by the rambling 16th-century Ahilya Fort dominating its tranquil riverbank, the magnificence of its adjacent Ahilyeshwar Temple, the breathtaking views of the sun setting over the wide expanse of the Narmada, and the tidy steps of its ghats stretching along its banks. I spend the next day alongside the river, strolling or sitting on the ghats and taking in the constant comings and goings. At sunrise, the faithful are already here offering prayers and flower garlands to the sacred river. Despite the morning chill, they bathe in the holy water, cupping it in their hands and murmuring Sanskrit verses before letting it cascade over their heads, and sometimes into their open mouths. Bearded and barefooted men pace up and down the length of the banks chanting Om Namah Shivaya. Hunched over small shrines of Shiva lingas, guarded by statues of his bull Nandi, are women wrapped in woolen shawls, carefully decorating the idols with flowers and lighting sticks of incense, whose long smoky lines carry their prayers upwards. Later when the sun is warming the stone ghats, the air is punctuated with the slap of wooden bats beating laundry, as small groups of girls and women pound their clothes clean. Then, holding on to the edges of saris, they let them flutter dry in the wind, or lay them flat in long lines on the hot stone, creating long ribbons of color. At dusk, the faithful are back for the evening puja. The sing-song of prayers resonates once again along the river, and fresh garlands are laid and new sticks of incense lit for Shiva. Flowers and prayers are also offered to the divine river, on whose sacred waters are cast small oil lamps made of pressed biodegradable leaves. When it finally gets dark I climb up the steps of the fort and peer down over its thick walls. I gasp in surprise at the sight of hundreds of flickering lamps slowly floating down the Narmada’s dark waters, transporting prayers with them. A Bengal tiger (Panthera tigris tigris) resting in the shade in Satpura National Park. .
Pench National Park in the Seoni and Chhindwara districts of Madhya Pradesh is believed to be the place where Rudyard Kipling set the marvelous series of stories that he called The Jungle Book and that went on to become an animated classic. The Narmada River is much older than the holy River Ganges. The River Ganges came into existence after the formation of the Himalayan mountain range, whereas the Narmada River existed before this. This river valley is also rich in fossils, with fossils of dinosaurs, dinosaur egg-shells, and Stone Age tools having been found. Many fossils are around 60 million years old. 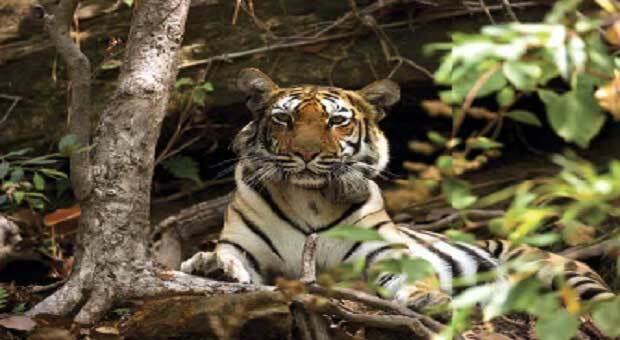 Madhya Pradesh is home to nine national parks and 25 sanctuaries spread over an area of 10,862km2. Madhya Pradesh is also home to some of the most renowned tiger reserves in the country – Kanha, Bandhavgarh, Panna and Pench National Park – where a large number of tourists, both domestic and foreign, arrive to see the big cats. Covering over 500km2, Satpura National Park is home to many indigenous animals, like the Indian giant squirrel, the Indian leopard, the four-horned antelope, and bird species like hornbills and peacocks. Tigers also roam here, but it’s rare to catch sight of one. One of India’s highest waterfalls is also found here: Rajat Prapat waterfalls fall from a height of 107m. Poha is probably the most popular dish in Madhya Pradesh and visitors should not miss trying it. This humble preparation is made of flattened rice mixed with ingredients like diced potato, lemon juice, coriander, peanuts, pomegranate seeds, green chilies, turmeric, and coconut. This is a favorite breakfast food, but poha can also be eaten as a snack or light evening meal and is a popular street food. The local weaving industry in Maheshwar was revived in the late 1970s with the founding of the Rehwa Society, which has its home in a building attached to Ahilya Fort. Here visitors can see weavers at work at their handlooms producing saris and other textiles made of natural organic cotton, silk, linen, and wool. Maheshwari saris are distinguished by their distinctive borders inspired by the architectural details of Maheshwar’s fort and temple. For three days and nights in February each year, the atmospheric Ahilya Fort and temple in Maheshwar become the exceptional setting of the Sacred River Festival. Some of India’s most renowned classical musicians, vocalists, and dancers are invited to perform here. The riverside temple is used as a majestic backdrop and is illuminated with the lights of dozens of oil lamps, creating a truly magical atmosphere.